Mars may have been arid for more than 600 million years, making it too hostile for any life to survive on the planet's surface, according to researchers who have been carrying out the painstaking task of analysing individual particles of Martian soil. Dr Tom Pike, from Imperial College London, will discuss the team's analysis at a European Space Agency (ESA) meeting on February 7, 2012. The researchers have spent three years analysing data on Martian soil that was collected during the 2008 NASA Phoenix mission to Mars. Phoenix touched down in the northern arctic region of the planet to search for signs that it was habitable and to analyse ice and soil on the surface. Satellite images and previous studies have proven that the soil on Mars is uniform across the planet, which suggests that the results from the team's analysis could be applied to all of Mars. This implies that liquid water has been on the surface of Mars for far too short a time for life to maintain a foothold on the surface. "We found that even though there is an abundance of ice, Mars has been experiencing a super-drought that may well have lasted hundreds of millions of years. 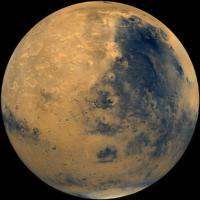 We think the Mars we know today contrasts sharply with its earlier history, which had warmer and wetter periods and which may have been more suited to life. Future NASA and ESA missions that are planned for Mars will have to dig deeper to search for evidence of life, which may still be taking refuge underground." During the Phoenix mission, Dr Pike and his research group formed one of 24 teams based at mission control in the University of Arizona in the USA, operating part of the spacecraft's onboard laboratories. They analysed soil samples dug up by a robot arm, using an optical microscope to produce images of larger sand-sized particles, and an atomic-force microscope to produce 3D images of the surface of particles as small as 100 microns across. Since the end of the mission, the team has been cataloguing individual particle sizes to understand more about the history of the Martian soil. They estimated that the soil they were analysing had only been exposed to liquid water for a maximum of 5,000 years by comparing their data with the slowest rate that clays could form on Earth. "...no such marker. They calculated that even if the few particles they saw in this size range were in fact clay, they made up less than 0.1 percent of the total proportion of the soil in the samples. On Earth, clays can make up to 50 percent or more of the soil content, so such a small proportion in the Martian samples suggests that the soil has had a very arid history." This 1 (one) Phoenix site is being compared w/ the whole of Earth. Not good science. What of the many pictures of rover tracks showing wet/muddy terrain in low lying areas? ?? I'd rather spend time in Death Valley than on Mars; and I have no intention of visiting Death Valley in this lifetime. Find me a planet with the same, or similar, resources as Earth and you'll have my undivided attention. After all these years, Mars is still a dry and dusty desert world. Humans are a puny species who haven't even managed to propel their asses out of the home planet's gravity for more than a few days. Nematodes probably know more about what constitutes a habitable planet. The surface will not host life. This has been known for some time and kind of beating a dead horse over the issue. What the surface has been scanned for is past markers for life or for the presence of life below the surface. Sadly, without getting below the surface to find out, we will not find anything. This article is like someone standing in the middle of a desert at high noon with no tools and saying life never existed here. We must look harder. Seems the image in question shows terrain on the sloping side of a crater. The inclination is too great to allow standing water.